When Twilight Sparkle receives a ticket to the upcoming Great Galloping Gala, it comes with a second ticket to bring along a friend. Which friend will she choose! If I had to make a criticism against this episode, it would be that it’s so lock step formulaic that I was waltzing alongside it each and every beat. Twilight earns a favor and needs to pick a friend to also receive favor. Every friend takes a turn presenting why they should be picked. Every friend takes a second turn trying to butter her up so as to be picked. She flips a metaphorical table. Realizing their error in making her choose among her friends, every friend rescinds their desire to be picked. Twilight rescinds the favor from herself as well so none will feel left out. As a reward for their lesson in friendship, the favor is extended to them all, and they all bask in their favor happily ever after pending the events of future episodes. Yes, it’s a very stock formula and ends exactly how I knew it would a few minutes in… but I don’t care. As I said, that’s only a criticism I’d make if I had to make one. But I don’t see anyone twisting my arm here, so consider it a criticism unmade due to the oodles of fun with which they execute said formula. Applejack – a boost in financial support for the family industry, so as to repair both the ragged farmhouse and Granny Smith’s ragged hip. Rarity – to not only see the Gala she designs gowns for, but a chance to meet and marry the potentially non-existent stallion of her dreams. Fluttershy – to meet all of the animals in the palace gardens. Personally, I’d vote for Applejack, as her plan comes with actual business execution and realistically attainable results through the earned profits (the sliding gold coins of which fan away my socialist commune pipe dream for what it was). Fluttershy’s plan is sweet, but I bet you anything she could just walk up to the palace and ask, and they’d let her in. I mean, come on. Would you say no to Fluttershy, you cruel, horrible person you? Rainbow and Rarity are as much a pipe dream as my societal hopes, which shouldn’t be painfully squashed, but do let’s have some sense of priorities. And Pinkie, c’mon. You’re just being mean, Pinkie. Adorably, cheerfully mean, but let Granny have a hip before shaking yours in a mountain of confetti. It’s ultimately not about who has the better reasons, but about Twilight really not wanting to let anyone down and potentially hurt a friend. Thus, the lesson of the episode as they hurt her by making it all about them when she’s trying to protect their group hug as a whole. I especially love just how frustrated she gets as they all start buttering her up – Rainbow with a hole in the rain cloud, Rarity with fashion, Applejack with apple desserts, Fluttershy with home cleaning, Pinkie Pie by dragging Twilight out of her home and blurting the open offer before the entire populace of ponies who all start hounding her as a crazed mob to the delightful tune of something highly reminiscent of “Yakety Sax”, and… Geez, Pinkie Pie. Seriously. Wow. Such cruel, gleeful disdain for all that’s good and decent. Anyways… where was I… Frustration! Yes, I love how everything going on, the maddening pleas and offers and dustcloud trampling mob, are all played against Twilight just wanting food. Just one bite to settle the swarm of gurgling insects visibly nested in her stomach if the animation is to be believed. All she wants is this one simple thing, then a whole haystorm of conflict swoops down and refuses to let her have it, until the very end when her sated friends, in their full recognition of their friendship, and gloating with smiles in the fresh rewards their friendship has won for them, all take her out for a meal. We never actually see this meal, but pending sudden revelations of future episodes, we’re left with the belief it shall soon indeed sate her belly insects. In many ways, the course correction in how they’ve decided to resteer the show (see our last writeup) is clearly visible in this episode. Twilight no longer has a mission, a driving purpose driven by her belief structure and deific overlord. She still has a relationship with Celestia, as her underling, but only as a casual stimulus for the plot as opposed to an overarching motive. That’s all pretty much gone as it’s just about a pony who gets a gift from her boss and can’t tell which friend she should friend more and share it with. There’s nothing about her being the outsider, nothing of her learning about this place and these people. Spike also feels different, less like a squire/assistant, more like the token boy, the “little brother” who’s always around, especially as he’s going on and on about how gross “girl stuff” is. Even though him loving any chance to party was pretty thoroughly established in episode 1. I’m not complaining, though. I do still regret the loss of the show’s original direction, but if this is an indicator of what we’re in for, I’m fine with that. I really like these characters. The plot may be simple, but a heap of fun things are done with it. The animation is still very strong. It’s fast and fun and colorful, and I’m even starting to get into the songs of cruel mistress Pinkie Pie (helps that they’re only snippets here instead of full numbers). And I even really like little world bits, such as the restaurant serving flower sandwiches and hay, or continued consistent use of horn magic in place of hands, or saddles of a fashionable nature. I’m really enjoying this show. Even as I’m writing this at 3 in the morning on a work night and I have to be up in five hours and why is this room filled with confetti is that you in the dark Pinkie Pie I know you’re there and can hear you bouncing…. As has been mentioned last week already, this episode marks the shift towards the slice-of-life formula that the show will take and run with for pretty much the entirety of the series (with breaks for adventure sprinkled here and there). It’s rare from here that there will be any overarching story-lines that the series will deal with, aside from two-parters and occasional looks back at what came before down the line. This episode is the first of one of the only times the series will play the a long game with a particular story (arguably, the entire series does this from the perspective of Twilight Sparkle’s own personal arc, so there is that), and the Gala storyline is one of my favorites the series will ever do. There’s really only three episodes dealing with it, but they act as landmarks for this season in a way, with the beginning kicking off the season proper for us, a revisit of the story at the mid-point, and finishing out the season with the event itself. This episode is also pretty frequently put forward as a better introduction to newcomers to the series than the two-parter, likely because it’s a better fit with the rest of the episodes this season as far as style goes, but also because all of the characters and their personalities still shine through pretty well to give a first-time viewer a decent idea of who they are without the show specifically going out of its way to try to introduce them all. The ponies’ reasons for wanting to go to the Gala are all very in line with their characters, but beyond just the specific “what” behind their thinking, I love the insight to them we get with exactly how their fantasies of the event play out in their heads. Pinkie envisions a carnival, Rarity imagines a fancy aristocratic ball, Rainbow Dash dreams of a large-scale performance, Applejack sees lines of ponies eager to shell out for her goods, and Fluttershy isn’t even interested in the Gala at all but rather is focused on the gardens being open. The differences are (for the most part) subtle, but comparing what each pony thinks the Gala will be like in their heads gives you the idea that either the Gala is such a huge event that all of those different concepts would fit in it, or that, possibly, one or all of them might be a bit off in their expectations. Also, sorry Noel, wasn’t sure whether or not to let you down easy about it or to just let you find out naturally, but Equestria definitely has a vaguely capitalistic economy going on. Socialistic elements do exist, but the world as it’s set up does involve ponies being expected to pay for goods and services and have some kind of income from somewhere. It’s nothing that’s ever really looked too closely at (although the Apple family farm needing the income to sustain itself is a concept that gets revisited a few times), and all of our main characters are basically considered employed in one way or another (Fluttershy’s job is somewhat vague, but the others all have clear occupations, with Twilight having started to run the Golden Oaks Library as of this episode). Also taxes are a thing, based on one of the random mob ponies offering to do them for Twilight in exchange for the ticket. Spike, notably, is still sort of settling into his role as a character. He’s not quite there yet, and this episode’s a bit bumpy for him. He’s not bad in it, by any means, but early on here the writers (along with Cathy Weseluck, who voices him) struggled a bit trying to work out just how young he was supposed to act. Originally they leaned more towards the very young end (he was introduced as a baby dragon in the first episode, after all), and thus we get him talking about snack time and naps in these first few episodes, and filling the “little brother” role as he spends the episode complaining about the girly dance party that he secretly wants to go to. We get an awkward antagonistic line at the end from Applejack shooting back at him, mistaking his incoming letter as exaggerated nausea (although to be fair, he was legitimately doing that just before then) and I’m not sure on the whole that it was all totally necessary. Thankfully that particular part of his character gets dropped very quickly beyond this episode, and while he still definitely fills the “little brother” role for Twilight as much as he does the “library/lab assistant” one, he does start feeling less like the token boy of the series and more like a genuine part of the overall group soon. Also just to answer Noel’s question real quick, the Shadowbolts were a separate (and at least as of season 4, completely fake) group from the Wonderbolts. While I’d like to think Luna’s original stint as Nightmare Moon involved her having her own team of stunt acrobatic fliers and that she conjured them from memory (although later revelations make that seem unlikely, although not impossible), it’s more likely that she just made up a “shadow” version of the team Rainbow Dash obsesses over. To stick up for Pinkie a bit, she is technically the only one out of the group who wants to go to the Gala for the sake of actually going to the Gala, as all the rest are more interested in what they can get out of the event then they are in the event itself, and to be completely fair to her the only other motives that she knows the others have are Rarity and Fluttershy’s, since she wasn’t present to hear Rainbow Dash and Applejack’s reasoning. Although she does ultimately wind up making Twilight’s day miserable on more of a level than any of the others (even if inadvertently), through her oblivious blabbing about Twilight’s extra ticket within earshot of half the town. We get another two songs in this episode, both by Pinkie (Shannon Chan-Kent once again doing the singing voice), and both are pretty short. Nothing particularly special about either of them (they generally get left out of anything other than extensive song lists), but they’re both fun. Looking forward into future episodes this season, I had kind of forgotten just how much the songs this season are dominated by Pinkie (and how many of them are short little ditties as opposed to full numbers). That will eventually change, but at the moment doing random songs out of nowhere is kind of Pinkie’s thing. Angel makes his first appearance this episode, and the little brat of a bunny pretty much establishes himself as Fluttershy’s shoulder-devil right away. We’ll see him showing up quite a bit throughout the series, serving mostly the same purpose he does here, largely pushing Flutters towards taking action when she’d likely just step aside and let the others have their way (assuming, of course, that what Fluttershy wants is in line with what he wants…). I love that he just straight-up steals the tickets out of Spike’s hands to hand them over to Fluttershy. The song Fluttershy is humming when Twilight walks in on her cleaning the library? The original My Little Pony theme, once again. I really like that it’s not entirely clear whether or not the prince Rarity is fantasizing about actually exists, as it sort of drives home the point that it’s the idea of high-society that she’s in love with and not necessarily that she’s crazy over a specific guy. 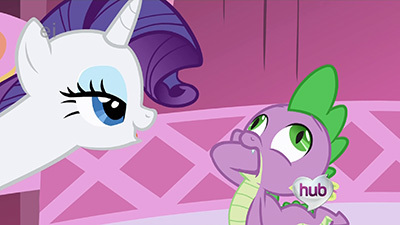 It’s something that got touched on a bit in the first episode (and will be revisited again later), but Rarity is actually somewhat torn between wanting badly to be considered high-class and leaving her comparatively humble start behind and being firmly rooted in the place where she lives and the friends she’s come to know. Oddly enough, there’s a parallel between her struggles with what she has clashing with what she wants and Rainbow Dash’s issues with the same thing (for being considered something of the opposite end of the “girly” spectrum from Dashie, the two actually have quite a bit in common). We’re also introduced to the concept that dragons eat gemstones this episode. It’s a very brief, almost throwaway line from Spike at the restaurant, but it’s a decent subtle bit of blink-and-you-miss-it world building. It’s not the first look at it (that happened at the end of last episode) but there’s a more on the nose example of Twilight not being particular good at teleportation magic yet in this episode. She can definitely pull it off, and the implication is that it’s EXTREMELY hard to do (she’s the only unicorn we’ll ever see doing it unaided in the series), but this early it appears to take an awful lot out of her, and Celestia help you if you happen to be dragged along with her in the spell. Over time she’ll get much, much better at it, but I love that they lay the groundwork here that she really is still learning and improving over time, and that she doesn’t just start out a master of her own talent. Speaking of Twilight’s magic, I like that she seems to have accidentally cast the teleportation spell under the extreme stress of desperately trying to escape the town. The implication that she doesn’t even really have full control over what she’s doing all the time, especially when frazzled, is really interesting (and also sets up a very good reason as to why she’s so invested in her studies). There are SO MANY great lines in this episode. Part of me wants to list them all, but I’d also just be quoting half the episode if I did. Pinkie’s non-sequiter “Oatmeal, are you CRAZY? !” is kind of classic to her character (and makes me wish I could hear exactly where things derailed in her mind that took her from arguing about getting a ticket to suddenly telling that anecdote), but I think my favorite goofy bit is Fluttershy making a very brief attempt at covering her motives before a glare from Angel has her switch gears and unabashedly admit that “yes, we are just doing this for the ticket”. I mentioned it in the first episode, but this marks the last episode that Lauren Faust is directly credited with having written (she’s credited as co-writing it with Amy Keating Rogers). That said, The Ticket Master had never really registered as a memorable episode for me. Maybe it’s because my first exposure to it was when I was still in a not sure if want phase and all subsequent exposures came with the mindset of “it’s just that episode after the premiere,” but for whatever reason I was never a huge fan of it. However, after coming full circle through nearly 100 episodes back to here, I see clever writing, witty comebacks, funny gags, and above all, six beautiful characters (oh, and Spike) that are just setting out on their journey through friendship. I suppose it’s a case of “absence makes the heart grow fonder” for me. It’s certainly not my favorite episode, but it’s the start of something wonderful. Okay, enough of that sappy stuff. Let’s talk total hip replacement. As someone who works in the orthopedic surgery field, Applejack’s wish to raise enough money to afford a new hip for Granny Smith intrigues me: how does major surgery work in Equestria? I imagine that unicorn doctors could telekinetically manipulate surgical tools and prostheses, but could unicorn magic reconstruct or repair bones and tissues directly? Based on what future episodes hint at with regard to different levels of magic (here we go again, future references) it seems like this might be beyond the realm of normal unicorns. Alicorn magic could probably do it (it can raise the sun and moon, for cryin’ out loud), but I suspect there is an understanding that Princess Celestia (and now Princess Luna) is not around to play doctor to everypony. So, my bet would be on the “unicorn surgeons manipulating tools telekinetically” thing. That said, earth ponies are often portrayed in fanart and fanfiction as very skilled engineers capable of constructing complex machinery, so at least in fanon-land earth pony surgeons are probably viable. Not too sure about pegasus surgeons, but I suppose if I were a pegasus and my wing got all busted up I’d probably prefer a fellow pegasus to perform the surgery. So maybe each type of pony is best able to perform surgery on its own kind, but could help another in a pinch? Last week Tessa mentioned how Applejack’s and Rainbow Dash’s Elements of Harmony sometimes seem like they should be swapped. Not even one episode into the “normal” part of the series and we already see this coming out. Rainbow wasn’t spying, she was napping. +1 to honesty. Applejack’s reason for wanting to attend the Grand Galloping Gala? Earn money to support her family. That’s a +1 to loyalty for her right there. Even Fluttershy gets in on the action with “Oh, yes, we are just doing this for the ticket.” Not sure she was part of the competition anyway, but +1 to honesty for best pony anyway. The competitive AJ/RD dynamics come out swinging in this episode, too. +1 to those two. Despite me throwing out numbers left and right like this, I probably won’t actually be keeping score. That said, those two are already far ahead of the competition in terms of best character pair dynamics. And we haven’t even really seen much of the competition! World-building time: this time about food. Tessa mentioned the quick hint that dragons eat gems (though Spike at least will evidently also settle for hayfries); we also get to see what “normal ponies” eat on “normal days” outside of the apple fritters and cupcakes and hot sauce cupcakes (they’re actually not too bad, try one sometime) and all that party food we’ve seen previously. It makes perfect sense that ponies would eat flowers and the likes, what with them being vegetarian and all, but when you first see Twilight snarf down these flower petals your mind immediately goes, “What, was she THAT hungry? !” until you realize, “Oh, that’s not only perfectly normal but entirely expected.” To be surprised by the mundane… I love it. Here’s another strange thing that we see (well hear): many (most?) of the random background characters have voices that all sound somewhat “off” somehow. We got it in the opening lines of the first episode in Canterlot, and here we get it with all the background ponies trying to sweet talk the ticket from Twilight. I don’t know how to describe it other than… off. All similarly off. 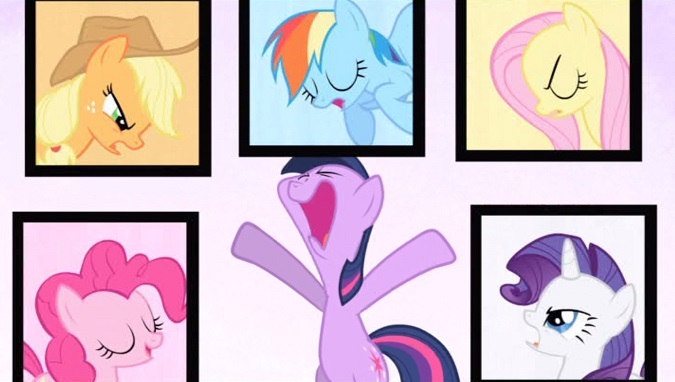 In fact, I can’t really think of any background ponies that don’t sound “off” until waaaaay down the line in Season 4. I suspect it was just a matter of, “Whoops, we need some random lines, here read these lines in whatever voice you can think of,” but none of those voices ever sounded particularly, er, not off. This effect has certainly not gone unnoticed by the fan community: check out the last paragraph of the MLP Fan Wiki article on Bon Bon, for example (spoiler warning for those who haven’t seen the series yet!). Like Tessa, I also see the teleportation scene as a very nice way of establishing a sort of “baseline” from which Twilight can grow. Every character matures in different ways through the episodes, and Twilight’s mastery of teleportation is one that is carried pretty much through the entire series (at least through Season 4, which at the time of this writing is the most recent one). That said, she does admit that she didn’t even know that “it” (presumably the teleport) was going to happen this time. What was she originally planning to do in that alleyway then? Blind everypony with a solar flare? Summon Cerberus from the pits of Tartarus to chase them away? Turn them all into orange frogs? We may never know! 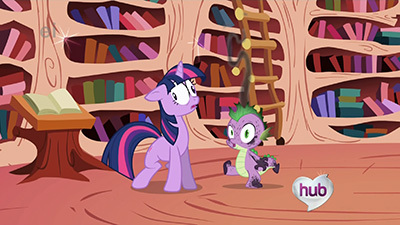 A little bit of an obtuse (and I’m sure entirely unintentional, that said in all seriousness…) parallel here about Spike secretly wanting a ticket and being giddy when he finally got one and the whole “brony” phenomenon (…because bronies weren’t a thing when this episode was written). Spike certainly puts on a show of not wanting to go, just as a lot of adults (men and women alike) who are not part of the target demographic of this show may put on a show of not liking the, er, show. But then, lo and behold, they do like the show after all, just as Spike likes the idea of being able to attend the Grand Galloping Gala. I’ve known one or two “anti-bronies” who started out aggressively against the whole notion of a grown man possibly enjoying “a show for little girls” who wound up being pretty devoted fans. Put on all the show you want, but at the end of the day, it really comes down to what makes you happy, what gets you excited, what brings you together with friends. Sometimes that’s not something that people would expect… maybe not even you. That’s not to say you can’t be happy with what people do expect or that people who have interests outside of the norm always succeed in finding what makes them happy. Rather, when you find what brings joy to your life, whatever it is, you can share some of that extra joy with others. And it looks like Spike figured this out by the end of the episode! Pinkie Pie would be proud. For a parting song: She’s an Alarm Clock, an example of what the brony music community does with something as tiny as Pinkie’s Grand Galloping Gala ten-second ditty. Actually, this is a remix of a remix that itself has been remixed at least a half-dozen times. Remixception! What surprised me was learning this started out as a short half episode (which is what was written by Faust) and that the other writer came in and had to add all the stuff expanding it to a full half hour. They did a very seamless job of it as I don’t feel the padding at all.